All of London is abuzz with the tale of Will Repton. The lone survivor of a massacre in Tibet has returned to England a hero, but the traumatized explorer has no time for glory. Another dangerous expedition awaits. Nothing will deter him from his quest, and no one will unearth his secret-until Will meets Charlotte Baker. 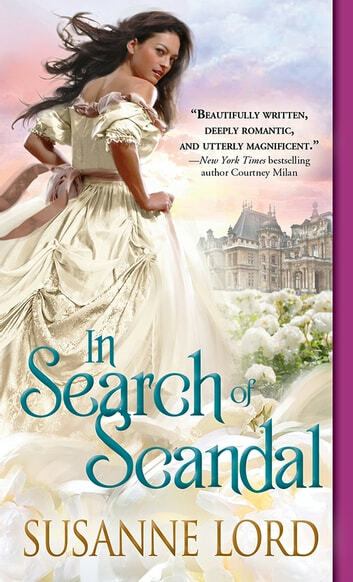 Vivacious Charlotte Baker also has a mission-to find a man whose bold spirit matches her own. When she meets Will Repton, she immediately recognizes him as her soul mate, and she's naively willing to turn her back on the rules of propriety to ensnare him. Will is torn between his fascination with Charlotte and his vow to finish his quest. He knows what it is to risk life and limb-but what if his most perilous adventure doesn't lie across an ocean, but within his own lost heart? With the heart of a warrior and the spirit of an adventurer Will Repton has faced calamities others can only imagine. When his last one ended tragically with him the sole survivor he returned home to a hero's welcome with a heavy heart. I received an ARC of In Search of Scandal in exchange for an honest review. Susanne Lord does a beautiful job in presenting a man questioning his value. Will came home a changed man. His physical limitations and awareness of his surroundings are more pronounced. He may be home but he feels like the odd man out. He and Charlotte were magic together. She opens his eyes to the fact that in life everyday is a new experience and no matter where you end up someone always has your back. This was a serious story that was laid out with sensational skill and characters that are entrancing.